Our 60th release is from legendary west coast lyricist RAS KASS!!! 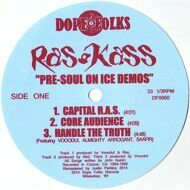 The "PRE-SOUL ON ICE DEMOS" EP is 6 tracks of demos and rare tracks from RAS KASS' underground beginnings! We've cleaned up the demos as much as possible, to give you the best versions of these rare tracks. Taken from Ras Kass' own personal archives.